Acclaimed Pianist Marjan Kiepura and Narrator Jan Knox present “Images of a Homeland,” a performance of piano works by Frederic Chopin, Tuesday, Aug. 22 at 2 p.m. in Taylor Community’s Woodside Building. This free event is open to the public. Chopin’s work was influenced by his strong connection to his native Poland. Detailed program notes will be available at the event. Kiepura was born in Paris, France and accepted to the Juilliard School Preparatory Division. He studied with Jeaneane Dowis and later coached with Menahem Pressler. 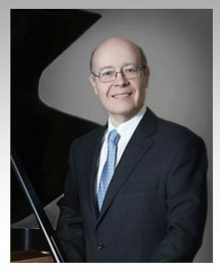 His development as an artist has led him to focus on the music of Chopin. The pianist has given concerts in the U.S. and Europe of this composer’s works. His own Polish ancestry has made Chopin a favorite choice of repertoire. Kiepura is also a published author who has written about Chopin. He lives with his wife Jane Knox-Kiepura in Littleton, NH.